Wandering the streets after I visited Piazza di Spagna I headed towards Piazza Navona and after I took some time to marvel at the beauty of this place I headed on a little street and walked for no more than 200 meters until I reached this restaurant. 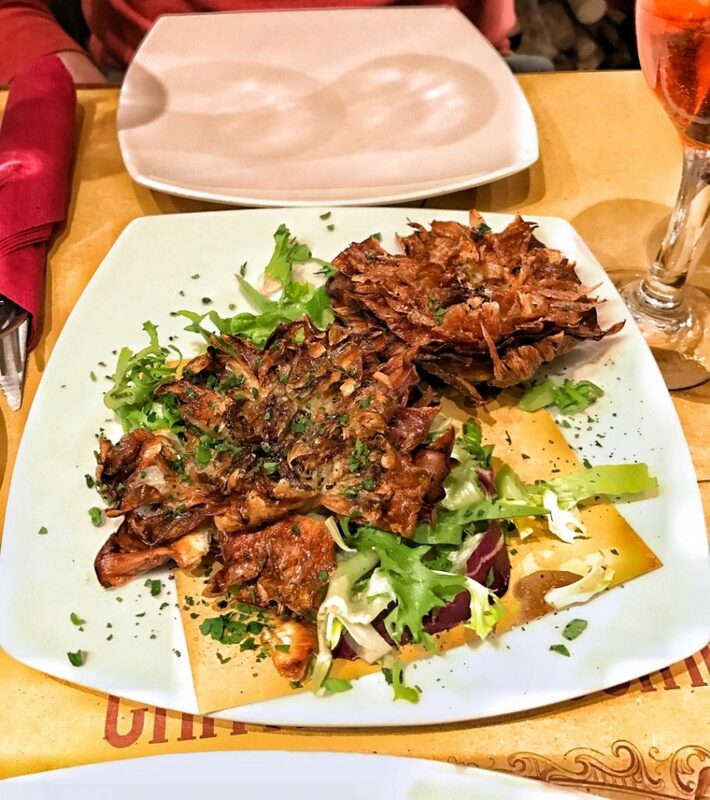 This review is based upon the 3 lunch meals I ate at Cantina e Cucina, every time choosing different dishes, chosen by me or recommended by the girls there. When I first entered the place I was greeted by a very nice girl (Alice) who took me to my table and brought me 2 menus (one in English one in Italian). She was also the person who recommended the pasta homemade the second day I ate there and I really enjoyed that dish. Upon her suggestion I also tried the tiramisu (is a must). From what I recall I tried on those days the crispy roman artichoke, the French fries cheesy and peppery, pasta homemade, ravioli with ricotta and spinach, pizza Quattro Formaggi and the tiramisu. There are rarely dates when I am impressed with everything I try at a restaurant but Cantina e Cucina managed to impress me from day one. Try the pasta homemade. Yes, cheese and pepper. Simple no? Sometimes simple means just perfect and this accurately describes this dish. Anything else added to it would just have ruined it. The pasta is a bit salty, due to the cheese, and the pepper tastes strong making it a wonderful mix. Ravioli with ricotta and spinach. My only complaint about this could be the portion size. I could have eaten easily another plate, that’s how good it was. The fresh basil, the home made tomato sauce mixed with the ravioli and spinach made me place this dish amongst one of my favorites. 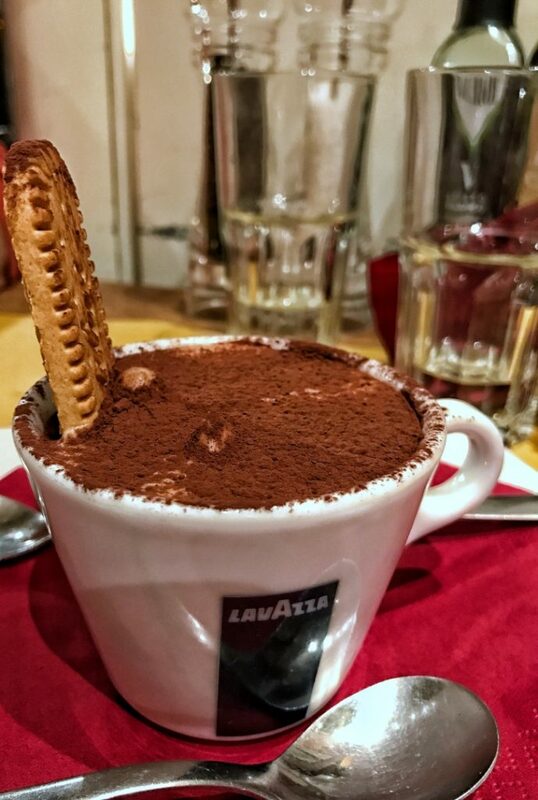 The tiramisu. Must try. But unlike many other places where a tiramisu can be eaten with a fork here a spoon is needed. Served in a cup with a topping of cocoa above it, it was the perfect desert after a satisfying meal. After all of my meals there I was served with small shots of limoncello(free of charge) and one time I received little biscuits that were delicious also(free of charge also). At the end of the meal the girls brought me a small card asking if I enjoyed my experience to leave a comment on Trip Advisor on their restaurant page. It was my first review ever on Trip Advisor and that says a lot about the quality of food and service at Cantina e Cucina. What I really enjoy about this place, besides the food, is how alive it feels throughout the day. I ate there at different times and people were always inside, always chatting, drinking wine or enjoying a good meal. If you pay close attention to things you will notice that none of the restaurants in that area, not the one across the street, none have so many customers passing thru their doors. And it is not a coincidence. It is the blend between food, great staff and a cozy place that you enjoy visiting. Since my visit there in March I recommended the place to two more friends who visited Rome and they thanked me for this place. So if you are visiting Rome save a spot in your agenda for this place. I am sure you will not regret it.